2017 was a great year for the stock market indices. For a small handful of active managers, it was a banner year as they stood out among their peers, winning a coveted spot in the top 25% of fund managers, capturing the lauds of the financial media—and the attention of new investors eager to jump onboard. Investors in those funds may be optimistic that they picked the manager that has the stock-picking prowess to go the distance. While hope springs eternal, history packs an unwelcome message, and a caveat that lucky investors would be wise to take the loot and scoot. Just ask most of those who are still holding 2015’s big winners. 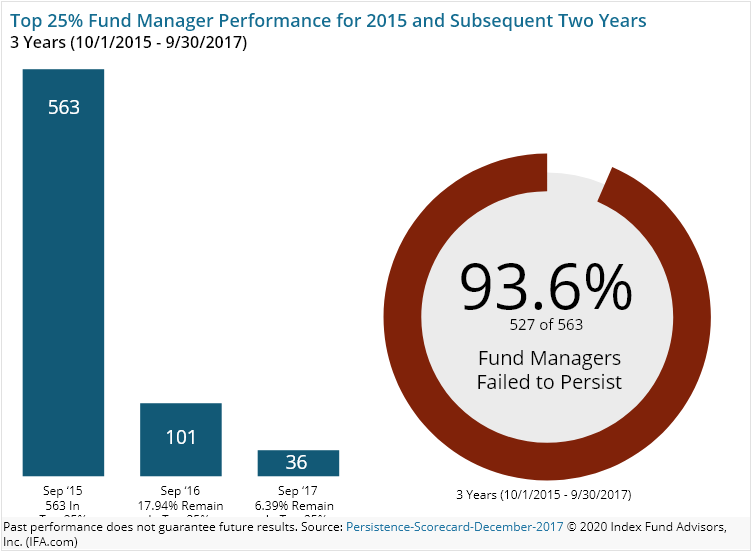 Year after year, research from the S&P Dow Jones Indices tells the same story: the vast majority of winning fund managers fail to persist in subsequent years. There is a very good reason why every mutual fund must state: “Past performance is not an indicator of future outcomes.” It’s true. S&P Dow Jones’ January 2018 study reveals that a whopping 93.6% of 2015’s winning domestic active managers failed to persist in delivering superior performance in 2017. Put a different way, a measly 6.39% of managers maintained their top spots just 2 years later. Digging deeper, 2015 produced 563 top-quartile domestic fund managers. Two years later, just 34 managers maintained their status in the top 25%. The results are slightly worse than 2016’s findings showing 92.7% of managers failed to stay in the upper quartile. 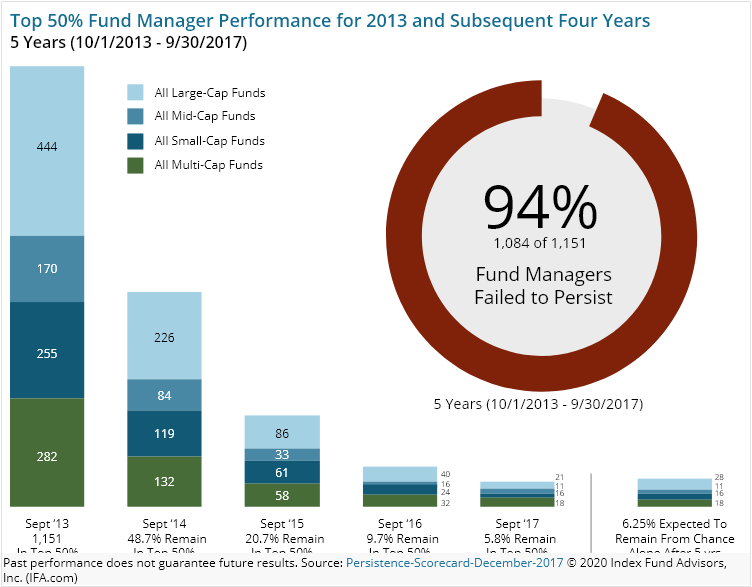 While two-year persistence is scant, five-year persistence is non-existent, with the study showing not a single manager from 2013 remained in the top quartile in 2017. 1-yr =25%, 2-yr=6.4% and 5-yr =0%. The results of the studies conducted by S&P Dow Jones Indices beg one simple question: Why bother with active investing? If active manager persistence is non-existent, the active manager selection process is reduced to essentially throwing darts at a dartboard, paying a high premium to do so relative to simply buying, holding and rebalancing a diversified portfolio of index funds, and with no discernable upside potential. What’s the lesson here? : Active manager performance is a function of luck, not skill. If active managers had skill, repeatable outperformance relative to peers would be a foregone conclusion. Alas, manager performance, both positive and negative, is a function of the markets favoring manager style—whether they happen to be in the right place at the right time. The non-existence of a manager’s ability to forecast the next winning style is evidenced in the lack of performance persistence. In other words, markets make and break winning managers, making active management an expensive game you’re simply better off not playing. A diversified portfolio invests across all styles, all sectors, and all countries that have a history of rewarding investors over the long haul. Control your costs by NOT paying an active manager to gamble with your money. Know your gut for risk, know your time horizon for your investments, and read and heed the fine print.